NEWTON, N.C (March 10, 2012 ) Hickory Motor Speedway opened the gates Saturday night for the Spring Fling Season Opener, officially starting the track's 61st season of stock car racing. After starting the race from the pole position, Josh Wimbish, driver of the No. 57 late model, battled the No. 12 of Austin McDaniel to the bitter end to capture his first win of the 2012 season during the 100-lap Bojangle's Late Model feature. Josh Wimbish, No. 51, led the field to the green flag for the caution filled, Bojangle's Late Model 100-lap feature event. Just as soon as the field gained full speed, it was slowed after the No. 43 of Jesse LeFevers, reigning Hickory Motor Speedway Track Champion, experienced mechanical issues causing his car to stall on the backstretch. As green-flag racing resumed, Wimbish continued to lead the field, but the No. 12 of Austin McDaniel stayed close his bumper looking for the opportunity to move out front. The two began to pull away from the field when the second caution fell on lap 23 after the No. 4 of Mackena Bell went for a spin in turn four. Back under green-flag conditions, McDaniel pulled ahead of Wimbish taking over the lead. With McDaniel out front, cautions continued to fall when the No. 11 of Matt Piercy spun coming out of turn four on lap 48 and 51. The fifth caution soon followed after the No. 9 of Ben Rhodes went for a spin heading into turn one on lap 57. The No. 1 of Pietro Fittipalidi was the reason behind the sixth caution of the feature after experiencing mechanical issues, coming to a stop on the backstretch. On lap 76, the No. 16 of Clint Fields and No. 57 of Grant Wimbish connected heading into turn two bringing out the yellow flag for a seventh time. The eighth caution waved following the restart, when track officials called an improper restart. The ninth caution of the night came on lap 78 when the No. 19 of Kyle Moon spun on the backstretch. The No. 2 of Trey Gibson brought out the tenth and final caution on lap 85 after experiencing mechanical issues that caused his car to stall on the track. All of the cautions didn't work in the favor of McDaniel who managed to maintain his lead until the final yellow flag. As the field returned to green-flag conditions Wimbish began to put pressure on McDaniel in efforts to regain the lead. During the final 15 laps, the two battled door-to-door taking turns running in the top position. As the laps wound down, Wimbish powered ahead of McDaniel, crossing the finish line by mere feet. After a solid run, McDaniel settled for second, while the No. 04 of Dillon Bassett finished third, Rhodes fourth and Bell fifth. 21 cars hit the track for the Paramount KIA Limited Late Model 35-lap feature, with the No. 9 of Charlie Watson leading the pack to the green flag. Just as the field got up to full speed, the No. 51 of Jeremy Pelfry put pressure on Watson for the lead. The two battled side-by-side until lap eight when the first caution fell after the No. 12 of Annabeth Barnes spun into the outside wall of turn four. As green-flag racing resumed, Watson and Pelfry continued to battle for the lead. The field began to spread out on the track until the No. 72 of Jason Cochran spun around in turn three bringing out the second caution of the race. Back under green-flag conditions, the field sailed around the track until lap 22 when Pelfry and Watson connected headed into turn three sending Watson into the outside wall, leaving track officials to bring out the yellow flag for a third time. Pelfry brought the field to the green flag with 13 laps remaining. Just as the field came up to full speed, a wreck broke out on the front stretch collecting several cars in the back of the pack bringing out the fourth caution of the race and first red flag. Pelfry led the field back to the green flag, but his lead didn't last long as the No. 21 of Monty Cox quickly took over the top spot and began to pull away from the field. With less than 10 laps remaining the No. 15 of Brandon Atkinson moved into the second position leaving Pelfry to ride around third. As the laps came to an end Cox was the first to cross the finish line grabbing his first win of the season. Atkinson came home second and Pelfry third. The No. 00 of Shane Lee and the No. 75 of Landon Huffman rounded out the top five. The No. 99 of Roy Smith brought the WrenchRags Street Stocks to the green flag for the division's 30-lap feature. Smith's lead didn't last long as the No. 03 of Kevin Eby quickly passed the pole sitter taking over the lead on lap two. Eby and Smith continued to battle for the top position throughout the duration of the race. Smith used lap traffic to close the gap between he and Eby, but Eby powered ahead grabbing the win during the caution free event. Smith finished second. The No. 92 of Jason Stanley, the No. 64 of Marshall Sutton and the No. 5 of Mike Newton finished third through fifth respectively. The Super Trucks brought the 2012 Spring Fling Season Opener to a close with their 35-lap race. The No. 72 of Jason Cochran started the race from the pole position and found his way to victory lane, after the No. 33 of Jeremy Birch led the most laps. Birch finished second, followed by the No. 94 of Brad Cox, the No. 29 of Ricky Dennie and the No. 11 of Thomas Beane to round out the top five. 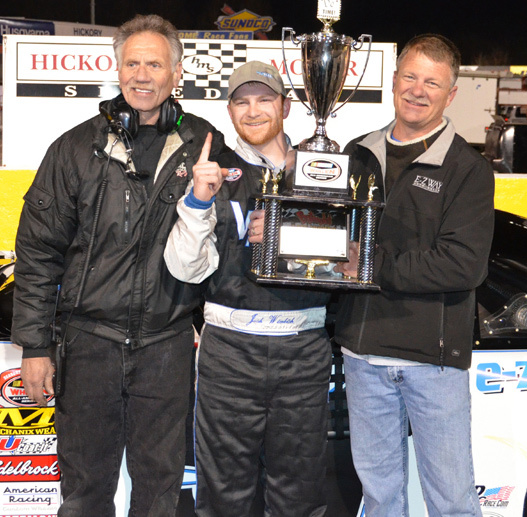 Don't miss the action next Saturday, March 17th as the UARA-Stars invade Hickory Motor Speedway. The event will feature the Carolina Vintage Cars, Renegades and a 150-lap feature for the cars of the UARA-Stars. Grandstands open at 4:30 PM, with qualifying at 5 PM and racing action at 7 PM. For more information about this event please visit www.uara-stars.com .